The subject of this notice was born at Huntsville, Ala., October 29, 1842. His father, Dr. James Gordon, now of Greenville, this State, was born in North Carolina, in 1818. Hugh Gordon, the grandfather, was also a native of North Carolina, and descended from a Scotch father who was one of the first settlers in the old North Stale. Grandfather Gordon carried on the trade of machinist, was a man of much natural ability, and the constructor of the first cotton gins in the State of North Carolina. He employed several men and carried on an extensive business for that time. In 1848 he removed to Elizabeth town, Ark., where he conducted a similar business, and died at the age of sixty-four years. A strong Whig, he was well known in the various localities in which he lived, and his influence was exerted in behalf of measures for the public good. His religious connection was with the Methodist Church. The father of our subject was reared in North Carolina and early began the study of medicine, graduating from the medical college at Memphis. His practice extended throughout North Carolina, Alabama, Arkansas and Mississippi. He is now one of the oldest practitioners at Greenville, this State. An honorary degree from the Missouri Medical College, at St. Louis, was conferred upon him, on account of his having so many sons in the profession, there being seven at that time. At the age of six months, our subject was taken from Alabama to Mississippi, where he resided with his parents until he was six years old, and then he removed with them to Russellville, Ark., where he grew to maturity. He attended school there until the age of fourteen years, when he entered his father's office for the purpose of studying medicine, and read with his father until he was nineteen years old. 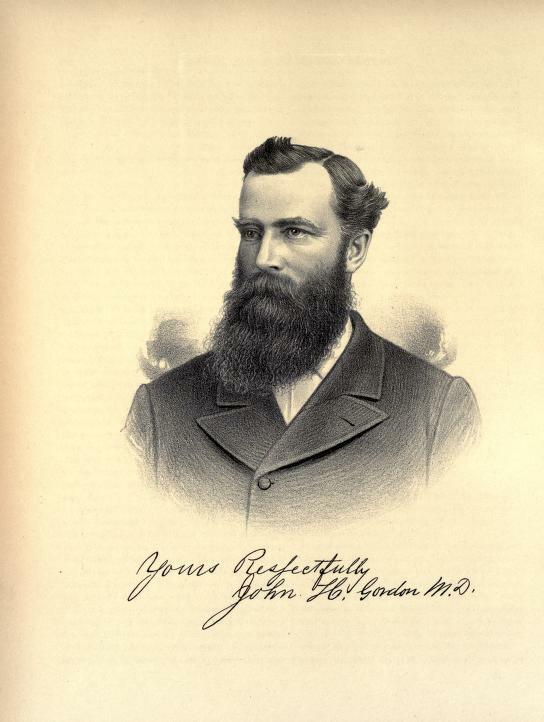 After marriage, our subject practiced three years with Dr. Brigham, a leading physician of Arkansas. In August, 1864, he moved here, and in October of that year he entered the St. Louis Medical College, and in connection with his regular course took a special course on female diseases. One year was spent there and then he returned here and practiced for a period covering ten years. Then, taking his brother, Dr. W. P. Gordon, into partnership with him, he returned to St. Louis and completed his course in the Missouri Medical College, from which he was graduated in 1876. Since that time the practice of the Doctor has been a great success, both in medicine and surgery. He has a fine assortment of the latest instruments for surgical work, to which he has given much attention, and he is called in every important case of this kind in the county. The marriage of Dr. Gordon took place December 15, 1861, to Emily Elva Torrence, who was born in North Carolina, December 11, 1844. The Doctor and his accomplished wife were schoolmates in Arkansas City, having met in a private academy which is now known as the Russellville College. Fourteen children have been born to this couple, only five of whom are now living. Dr. William E. is a practicing physician in Old Ripley, this county; Charles C. is also a physician, and assists his father in his practice; James L., Kate E. and George D. complete the circle of surviving children. Nancy J. died at the age of ten years. All the others died in infancy. Our subject has a fully-equipped and well-arranged office of three rooms general office, drug room and private consulting room. Every Wednesday is devoted to the treatment of female troubles, in which he is assisted by his wife, who is a well-read medical woman, and certainly is a true helpmate for her husband. Great success has attended the Doctor's practice, and he has been particularly happy in the treatment of female diseases. He has erected the most elegant frame residence in Pocahontas, which is also one of the finest in Bond County. It is two and one-half stories in height, with attic, and is 39x42 feet in dimensions. The architectural designs were prepared by Dr. Gordon himself, and the work was left in the hands of a superior man, who has finished each suite of rooms in differently carved wood. The furnishings are also of modern style, and the home is a model of elegance and good taste. Since he was fourteen years of age our subject has been a member of the Methodist Church; his wife is also a member of this church, and their connection has always been an active one. In his politics, the Doctor is a Republican, and has had experiences different from many who belong to the ranks. While living in Russellville, Ark., during the late war, he was conscripted into the Confederate army, although he was not in sympathy with the cause. On account of sickness he was discharged, but shortly after he was again forced into the service. He and another man of like sentiments were left to guard fifteen Northern prisoners who were sentenced to be shot. The guards turned the prisoners loose and all came North together, and it was in this way that our subject located here. Dr. Gordon is a member of Gordon Masonic Lodge, which was so named in honor of his father. He is also a member of the Gordon Camp of the Modern Woodmen and the Ancient Order of United Workmen. The State, County and District Medical Associations claim him as a member, and he has been a delegate to the State society and has been Vice-president and Director of the county association. 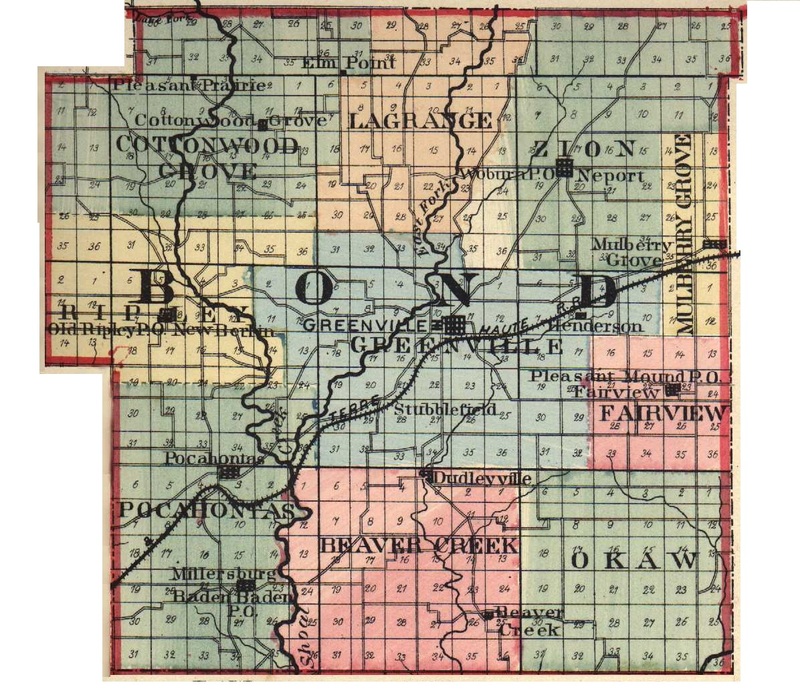 Extracted 20 Dec 2016 by Norma Hass from 1892 Portrait and Biographical Record of Montgomery and Bond Counties, Illinois, pages 366-369.